John Haffenden reflects on his edition of the Letters of T. S. Eliot, Volume 7: 1934-1935, which is to be published by Faber & Faber on 1 June. 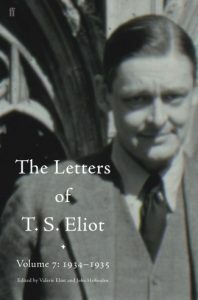 Perhaps the most newsworthy aspect of volume 7 of the Letters of T. S. Eliot – which covers the years 1934 and 1935 – is that at long last we get the fullest available representation of both sides of the frightful, agonising personal struggle between Eliot and the wife whom he had left in 1933. Eliot wished to treat Vivien with distant dignity, respecting her rights and interests. But he was resolute on two matters: he wanted (i) to secure a proper agreement for a legal separation; (ii) to retrieve his personal papers, books and family heirlooms which had been left at Vivien’s flat since his departure for an academic year in the USA, 1932–33. The situation became more strained and ugly as the months passed, and Eliot took the advice from his solicitors that the only way he would ever properly recover his possessions – since Vivien shunned the advice even of her own lawyer – was to get a court writ for a sheriff to enter her premises and retrieve his belongings. Reluctantly, Eliot authorised this step, and the bailiffs duly made entry to Vivien’s flat in December 1934. She cried out to whoever might listen that such a shocking incursion was illegal and outrageous, and had damaged both the flat and her own delicate state of being. She told her bank, ‘It was only by Brute Force that his things were snatched from me.’ But her lawyers – and other members of her family – would not heed her complaints, since they too had been urging her to respect the inevitable. Due process had been served. Sadly – at this distance we cannot put a name to the nature of Vivien’s illness, and perhaps it was even a compound illness: she may have been schizophrenic or bipolar, we cannot be sure – it is evidently the case that while some of the exceptionally talkative entries in Vivien Eliot’s diaries seem lucid and reliably observant, all too many veer towards the zany, obsessional, distracted and paranoid. She had in a way some reason to feel paranoid if not persecuted: the family, friends and servants who sincerely try to help her through the days and months often – for the best of caring reasons – tip off her husband about her activities. She hides out for days at a time in various hotels; she rents other flats for herself, and even for a while a whole house on Edge Street in Notting Hill. All the time, her own solicitor tells her frankly that he is glad to have to do business with such a gentlemanly, reliable, discreet individual as T. S. Eliot. Still Vivien seeks to surprise Eliot at his office – where the receptionist and secretaries find it a strain to have to fend her off, to tell her the necessary saving lies about his supposedly frequent absences – and she goes again and again to performances of his plays – The Rock which is staged at Sadler’s Wells Theatre in the spring of 1934, and Murder in the Cathedral in 1935 – and finds it all the more exacerbating that he is never to be seen in the stalls at his own widely applauded productions, or even at a curtain call. Eliot for his part is sometimes fearful of what she might do: he anticipates being ‘molested’. From time to time he dreams of himself as an Orestes being pursued by Furies: his state of mind adumbrates aspects of the fears and anxieties of the figure ‘Harry’ in his play The Family Reunion (1939). The climax to this emotionally lowering business takes place in November 1935 when Vivien comes face to face with her husband after a lecture he gives at the Dorland Hall, London, as part of the Sunday Times Book Exhibition. By this time she has convinced herself that Sir Oswald Mosley is the strong Leader that England needs during the crisis years of the 1930s, and she has delighted in joining the ranks of the British Union of Fascists. So she proudly wears her fascist uniform when attending Eliot’s talk at the Dorland Hall, and carries her dog in her arms, and at the end she sweeps down on Eliot to ask him to come home with her. The dog – which had once been Eliot’s pet too – leaps with frantic glee to greet her old master. Eliot says to Vivien, ‘I cannot talk to you now’, signs – ‘with automatic hand’ – three of his books that she had brought along with her, and makes haste to quit the hall.